Lazy Hazy Days of Summer AND Spicy Sangria! Did you know that in Spanish the word sangría means bleeding? 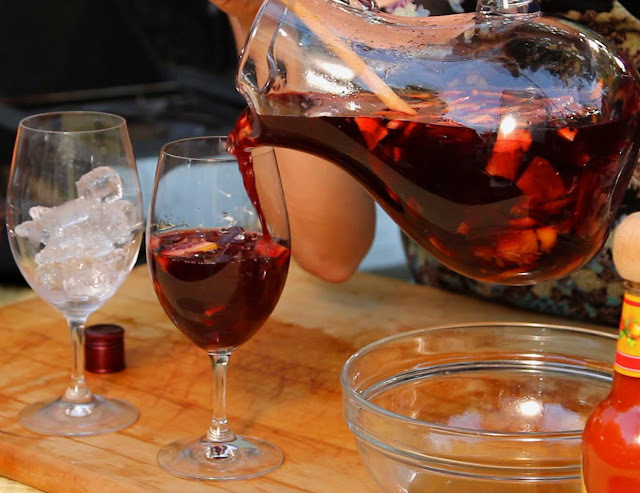 Well, this version of sangria is hearty red. And, since it's summertime I was thinking of this as the perfect cocktail to drink to enjoy outside. Summer time heat and sangria go so well together. Not just a regular sangria, but a spicy grilled fruit sangria full of the Foodgasmic "wow" factor. And it has a dash or two of my favorite hot sauce, Cholula. You can use whatever seasonal and/or local fruits that you enjoy.This is perfect to add to your summertime cookouts or just to slip with sitting outside watching the sun go down with your sweetie. It can be a Foodgasmic moment with your friends, a romantic one with your honey or enjoy a pleasurable adult beverage to slip alone. Cheers! There is always time for a delicious and fun salad. But before you can start with the salad, you need an amazing dressing. Here is a fun fruity one that I love to use for spinach salads. It’s a Balsamic Fig Dressing that uses fig jam and balsamic vinegar. I love the sweet savory taste in this dressing and since you make it in a food processor it emulsifies and gets nice and creamy. My favorite salad to serve this on is: baby spinach salad with pieces of fresh mango, toasted pine nuts and crumbled feta cheese. It’s a perfect spring and summer salad great for any occasion. It’s even fantastic to eat alone. Because you know, even though Foodgasms are best shared with others, they are just as tasty when dining alone. Put all of the ingredients into a small food processor or blender and pulse till it's well combined. Toss with or drizzle over salad.